Not Starkist Salad. Eat groovy. Save a tuna. The older I get the more I crave simple. You know what I'm talking about. Home cooking. 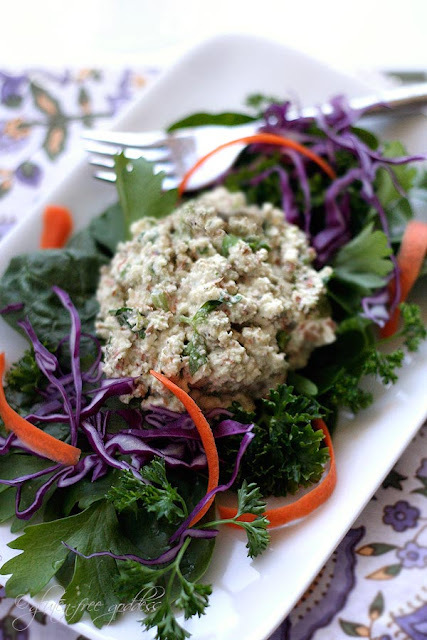 Childhood classics- like tuna salad. Instead of getting all worldly and sophisticated and dabbling with truffle oil, with each new gray hair my taste is hula hooping into kid-friendly food faster than Marisa Tomei can waggle. Well, maybe not that fast. She is pretty nimble. But you get my drift. I'm whipping up peanut butter and banana sandwiches, not oysters Rockefeller. Actually, I wouldn't know an oyster Rockefeller if it bit me in the tuchas. Filet Mignon (would you believe I've never had it?) doesn't even tempt me, Darling. And Chicken Cordon Bleu vs Chicken Kiev? Okay. It is here where I confess that I'm no Betty Crocker and I've never attempted either recipe. Most likely because I was never what you'd call a big meat eater. I went vegetarian at age thirteen. If I've dabbled at all in the culinary arts it's been because of Anna Thomas and not Julia Child . The first cookbook I ever bought was The Vegetarian Epicure . That was 1972- the first time I ever made soup from scratch, thanks to Anna. 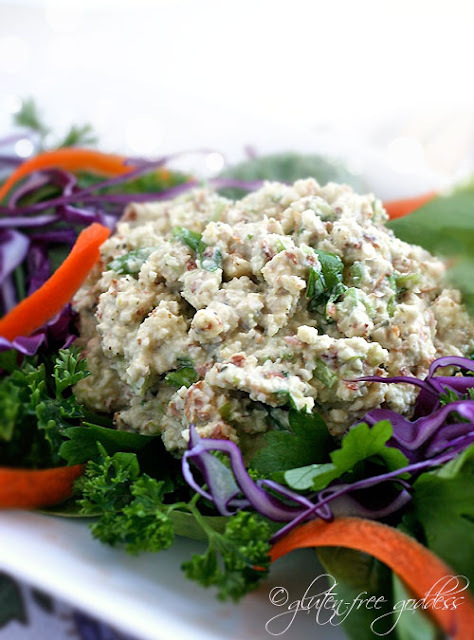 So when I discovered this inventive, almond based vegan tuna salad recipe over at Happy Healthy Life, I knew I had to give it a whirl. Because I'm digging raw food lately. And the idea of a protein salad a la tuna fish caught my fancy. It's fun for an appetizer- fab with crackers or tucked into lettuce cups. Or go ahead and make a classic "tuna" salad on rye with your favorite gluten-free rye bread (here's mine). First, you need to soak your almonds. 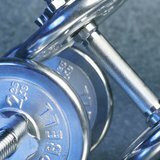 Plan ahead. Do it overnight for best texture. Soaking almonds to make them sprout. Place the almonds in a glass or ceramic bowl and sprinkle them with a little sea salt. 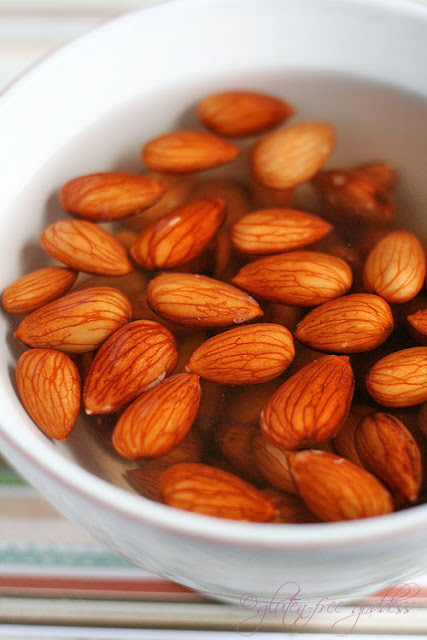 Pour in just enough fresh cold water to cover the almonds (some will float). Cover with a clean tea towel and allow them to soak overnight- at least eight to ten hours. Note- if it's very hot where you are, place them in the fridge to keep them cool and extend the soaking time to at least 12 hours. They should be soft when ready and you'll see tiny sprouts starting to bud at the tips. Soaked sprouted almonds, ready for salad-making. This tasty salad makes a great appetizer spread for crackers. I made my faux tuna salad using my own raw cashew cream sauce as a mayo, but if you prefer, you can use your favorite vegan mayo. 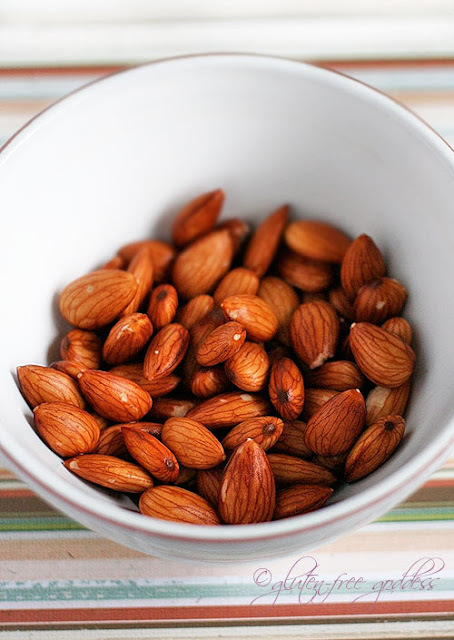 Dump the soaked almonds into a food processor bowl; cover and pulse until shredded. Add the liquids and pulse again. Add the cream or mayo, to your liking. Pulse again. You want it flaky. Taste test for texture. Add more liquid if it needs moisture to obtain the right consistency. Season to your liking with fresh minced herbs and and a dab of raw agave. Use in sandwiches, roll-ups, lettuce cups. Serve as an appetizer spread for crackers. If you like the taste of raw red onion, add a teaspoon or two of minced Bermuda onion. If you like curry, add curry to the mixture. Add chopped golden raisins for a spicy-sweet Indian twist. 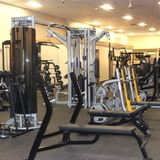 We are offering 20% off this all inclusive health and wellness package!